I have been asked to clean and adjust a set of PD46A carbs for a friend who bought a few basket case bikes with these as the only complete set of carbs in the bunch of parts. There are presently #90 main jets and #42 slow jets in the bodies of all four carbs which look to be factory jet parts. So what model of CB550 or CB500 motors did these originally come with and could they potentially be used on either a CB500 or CB550 motor. I believe he received a variety of CB500 and CB550 motors and frames in the purchase, mostly all basket case parts at this point. His plan is to work on getting one running bike from all the goods and this could end up being a CB500 or CB550 motor depending on what looks workable. PD46A carbs were listed as 1977 but with 38 idle & 90 mains. 1978 PD46C carbs were jetted at 42 / 90. From my experience the 90's are light and 100's are a better fit but each application is different. They will work on any of the 550 / 500's with some jetting adjustments. I have been asked to clean and adjust a set of PD46A carbs ... There are presently #90 main jets and #42 slow jets in the bodies of all four carbs which look to be factory jet parts. So what model of CB550 or CB500 motors did these originally come with and could they potentially be used on either a CB500 or CB550 motor. These PD carbs are not bad in themself, but the slow jets tend to clog up when the bike is not run on a regular basis, reason why some turn to the oldstyle Keihins like: 022A or 087A (much easier to work on), be it there is some matching to be observed between the carbs and the boots. It's not recommended to separate the carbs from the rack. Those carbs are off a 78 550. I just cleaned and rebuilt these same carbs on m,y bike. Make sure all the pilot jet passages are very clean and use spray to verify the passages in the carb bodies flow freely. As for jets... I am running stock airbox & paper filter with stock 42 pilots. I run a 4 into 1 exhaust. I jetted up to 92 mains because of the switch in exhaust and the bike runs rich mid to high rpm...the bike runs good but I can "feel" that it is not as crisp as it should be. I re-jetting back to 90 main's as my plugs are dark brown/black and the pipe exit is sutty. Stick with the stock airbox & jets and you will have a good running bike. PS: I used an aftermarket rebuild kit and had all kinds of issues with leaking floats and burrs in the jet passages. You will need to replace the O rings in the fuel lines but beyond this reuse as much of the stock parts as you can. You will need the correct manifolds, choke cable, throttle cable(s) and air box rubbers as well. Mine are 42 years old and still don't leak... So, test first, then you can decide. 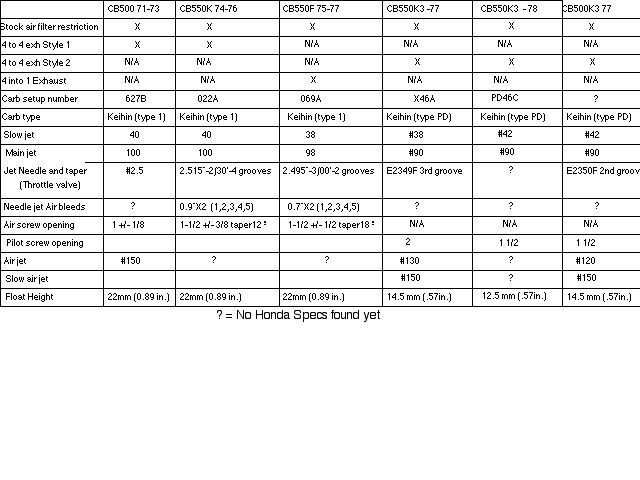 I appreciate all the info as I normally don’t work on CB550 models and it isn’t always easy to find the correct specs and proper model fitment. I have cleaned them after a completely tear down of the assembly. I am quite comfortable in doing this wilth pretty well any carb set up that Honda makes on the vintage stuff. It took an hour of boiling the #42 slow jets to get two of them unblocked and clean. Did a full Ultrasonic bath on the bodies and confirmed the passages are clear and replaced all the soft parts while keeping the OEM brass. Someone had already been in there and messed up the slides with the non adjustable one now in the #4 carb and not the #2 carb as Honda designed. The choke spring was also mounted incorrectly, so no way it was going to function either.